Bud Collins, who called himself a “scribbler and a babbler,” died Friday at his Brookline home. 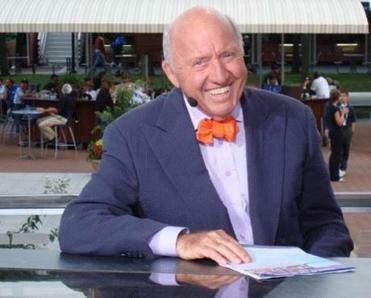 In the early 1960s, after joining The Boston Globe as a tennis writer, Bud Collins took a giant leap into the future of sports journalism when he stepped in front of a TV camera to offer commentary. As he expanded the reach of columnists, he called himself a “scribbler and a babbler,” and the words that emerged were as colorful and memorable as the custom-tailored pants he wore while covering more than a half-century of tennis championships. Mr. Collins provided the sport with its most authoritative voice, and wrote a tennis encyclopedia and a history of the game, all while remaining one of the most congenial people anyone met courtside or in the press box. He was 86 when he died Friday in his Brookline home. In September, he traveled to New York for the US Open, when the media center was dedicated and named in his honor, although his health had been failing the past couple of years. Considered the first sports print journalist to establish a regular second home on TV, Mr. Collins began offering tennis commentary for WGBH-TV from the Longwood Cricket Club in Chestnut Hill not long after he became a Globe columnist in 1963. His longest and most visible venue was at NBC from 1972 to 2007, notably with the “Breakfast at Wimbledon” broadcasts. Over the years, Mr. Collins appeared regularly on ESPN, the Tennis Channel, and the Australian Broadcasting Corporation, and his guest appearances spanned the sports listings of any channel guide. His bow-tied presence on camera is credited with enlivening the appeal of tennis as it rose to TV-viewing prominence. “He broke the barrier, the notion that you could be a newspaper guy and they would want you on TV,” said Globe sports columnist Dan Shaughnessy. Mr. Collins, who covered 44 Wimbledon championships, had his first Globe byline on Dec. 22, 1963, with a dateline of Adelaide, Australia, where he covered the Davis Cup. In his high-voltage prose, players “zipped” or “banged” winning shots. The opening of his final piece for the Globe, on Sept. 4, 2011, had the velocity of a Serena Williams serve. “Sister Serena is back. Bold, blasting, and bell-ringing — a woman with a cause to turn the world upside down as her property once again,” he wrote of her US Open appearance. Having begun his tennis run in an era when players were far more accessible, Mr. Collins was on a first-name basis with the sport’s luminaries. After losing a Wimbledon match to Martina Navratilova, Evert walked off the court to find Mr. Collins waiting, microphone in hand, on live television. “Nice pants, Bud,” Evert said. 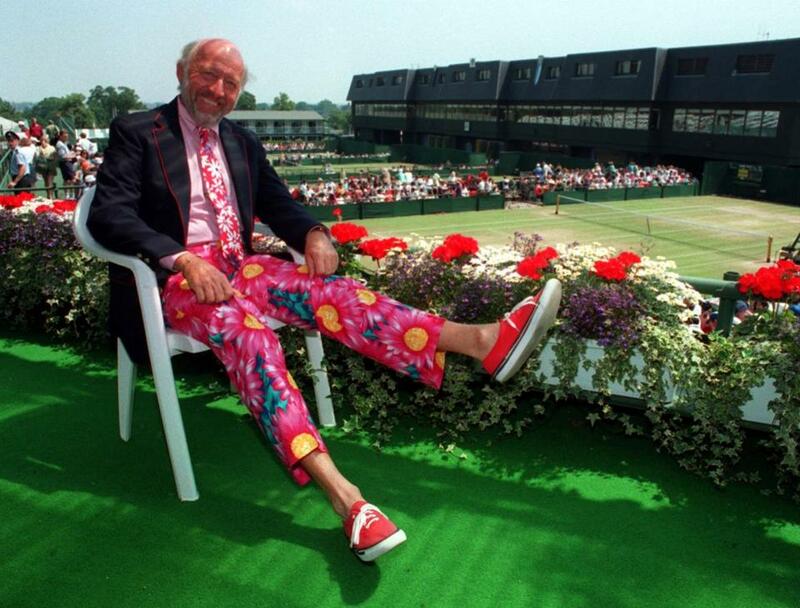 When he was inducted into the International Tennis Hall of Fame in 1994, his pants got a shout-out in the citation. On his world travels, Mr. Collins collected fabric that his tailor, Charlie Davidson of the Andover Shop in Harvard Square, turned into a sartorial trademark as unforgettable as Mr. Collins’s voice, which could soar to the lofty heights of a towering lob. Mr. Collins brought swaths of cloth to Davidson from as far away as Bangkok, the Himalayas, and New Zealand. For years, Mr. Collins augmented his tennis columns with travel features that ran under the heading “Anywhere,” a succinct description of destinations that included Cambodia, China, India, Italy, Nepal, Tanzania, and Tibet. While visiting Vietnam with the US Davis Cup team in 1969, he wrote about US combat soldiers and flew with Marines who fired rockets at enemy bunkers from a jet that “quivered abruptly as the fireballs left the belly pod. ‘Cu-wump! Cu-wump! Cu-wump!’ ” At one point in the trip, Mr. Collins also dined on terrier stew. “I felt like a traitor to Lassie, Rin Tin Tin, and Old Dog Tray,” he wrote. Mr. Collins didn’t confine his sportswriting to his favorite sport. He covered the Red Sox during their Impossible Dream season of 1967, and he wrote about Muhammad Ali dating back to when the prizefighter was still Cassius Clay. “A butterfly still floats better than a boulder. Even an old one named Muhammad Ali. And stings a lot, too. Enough to bewilder and hammer a young hardrock named George Foreman,” Mr. Collins wrote in 1974 from the “Rumble in the Jungle” bout in Kinshasa, Zaire. Born in Lima, Ohio, Arthur Worth Collins Jr. grew up in Berea, a suburb west of Cleveland. In 1999, he reminisced in the Globe about winning a third-grade spelling contest in 1938. As a prize, he and his mother rode in a Pullman sleeper railroad car to Buffalo, where a limousine spirited them to a swanky hotel to see Niagara Falls. “As the Depression raged, it seemed all the more unimaginably plush,” he wrote. He stayed in Berea to graduate with a bachelor’s degree from Baldwin-Wallace College, and after a stint in the Army, he drove to Boston, undaunted by a rejection letter from Boston University’s graduate program. He persuaded BU to admit him, and worked part-time at the Boston Herald. No one wanted to report on tennis, and an editor sent him to cover the state women’s championships at Longwood. “ ‘Now, don’t question me. You’re new on this and you just have to do what I tell you to do,’ but I was secretly thrilled,” Mr. Collins recalled his editor saying, in a video interview on a BU website. While at the Herald, he was part of a duo that won the US Indoor mixed doubles tennis title, and he coached the sport at Brandeis University, where Abbie Hoffman was among his players. Hoffman may have been a leftist radical politically, Mr. Collins recalled, but he was a conservative player, sticking to the baseline to notch many wins. Amid work and coaching, Mr. Collins didn’t finish his master’s, but BU awarded him the degree in 2009, accepting “The Bud Collins History of Tennis” in lieu of the long-abandoned thesis. Mr. Collins’s first marriage, to Palmer Collins, ended in divorce. Their daughter, Suzanna Mathews, lives in Sedona, Ariz.
His companion Judy Lacy, a tennis writer for the Boston Herald American, died of a brain tumor in 1980, and Mr. Collins raised her son, Rob Lacy, who now lives in Concord. In 1994, Mr. Collins married Anita Ruthling Klaussen, a photographer whose work illustrated his subsequent travel writings. Knowing nothing about sports and tennis when they met, she initially thought they’d have little in common. An early date took them to a Newbury Street art exhibit opening, where a steady stream of people from the non-sports world greeted Mr. Collins. “I thought to myself, ‘Everybody in Boston seems to know Bud,’ ” she recalled. A memorial service will be announced for Mr. Collins, who in addition to his wife, daughter, and Rob Lacy leaves four stepchildren with his second wife, Betsy Bartelt and Kristin Hunt of Colorado, Sharon McMillan of New York City, and Gretchen West of Ohio; two stepchildren with Klaussen, Danielle Klaussen of Cambridge and Karl Klaussen of Brookline; and 11 grandchildren. “Of course he was this country’s foremost authority on professional tennis — that much is indisputable,” said Timothy Leland, a former managing editor and assistant to the publisher who joined the Globe as a reporter in 1963, at the same time as Mr. Collins.